But that all changed now that Christmas has passed, for buyers are looking, these listings won’t last. The weather up North is really not nice, they’re driving around in heavy snow and slick ice. It wouldn’t be so bad, if the snow would just melt, the winter season is long, and that wind is just Hell. Snowbirds keep calling, new listings better come quick. I don’t know why they’re driving slowly, our roads are not slick. Perhaps they’re driving the neighborhood with a magnifying glass and map, when all they have to do is use our website or search our phone app. 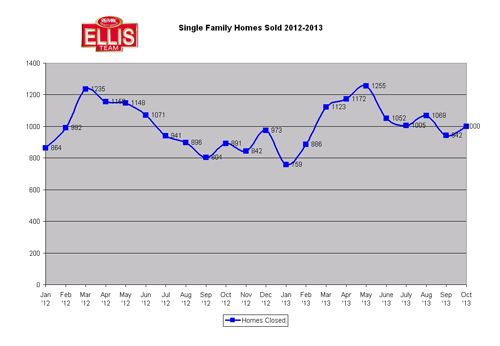 So please dear sellers, pick up that phone, always call the Ellis team, we’ll get your home sold. Phone calls typically don’t pick up until about Jan 15 or so as seasonal visitors get settled into their rentals. We do however have an influx of people visiting the week after Christmas and they may be here only about a week or so. When they see how nice SW Florida is, they quite often inquire about real estate. If you go to the beach around new years I guarantee you will see a lot of shirts from Wisconsin, Iowa, and OhioState. That’s because Florida has several bowl games and many of these fans come down to Ft Myers Beach for sun and fun before the game. This year Wisconsin plays South Carolina in the Capital One Bowl in Orlando Jan 1. Iowa also plays Jan 1 against LSU in Tampa. Ohio State plays Jan 3rd against Clemson in the Orange Bowl in Miami. We get visitors from all over and many from Germany and Europe over the Holidays. Once the New Year’s rush is over many of our visitors tend to rent monthly. It’s amazing how many calls we receive the day before they leave, and sometimes on the way to the airport asking to see a house. I guess they really hate to leave, and who can blame them? We moved here from the Midwest, and most people living here came from somewhere else. If you’d like to search the market as either a buyer or seller, visit www.Topagent.com If you need extra help we’re always available to talk to you and help you make better decisions. Our phone number is 239-489-4042 Good luck and Happy House Hunting! Where Are Prices Headed in the New Year? Everyone always asks where are prices headed in the new year? Buyers and sellers read the headlines and hear prices are up 13.03% over last year, but what does that mean? Are all prices up 13%? Is that the average price or the median price? If prices are going up, how much more will my home be worth next year? As you can see by the attached graph home prices maxed out this year around April. The average sales prices maxed out at $292,201 in April while the median sale price maxed out in June at $185,000, although April was a close second at $182,000. Prices have gone down regularly since April, so some might conclude that prices are actually falling, not rising. This isn’t true either. If you go back and look at 2012 the same pricing phenomenon was reached with prices maxing out in May before falling a bit later in the year. The difference is prices leveled out in the 3rd and 4th quarters of 2012. 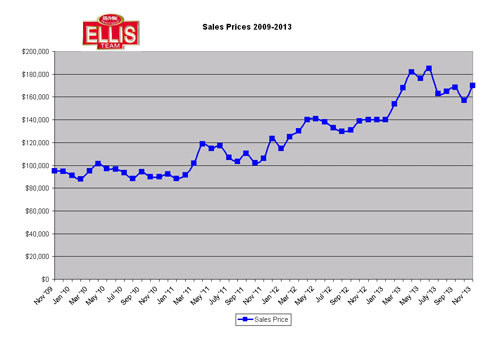 We have seen a leveling out in 2013 until the dip in October prices. We’ll be watching November and December data when it’s released to see which trend evolves. We don’t get too wrapped up in any one month’s data as certain sales can slip into the next month which can skew one month’s data up or down. For the past few years season has dictated where prices will go for the following year. By season I mean sales occurring in Jan-April and closing into May. We do have a bit more inventory to sell this year, and our inventory prices are higher than they were last year, so logic would dictate as long as the market responds with sales at those prices we should have a pretty good season. Some economists are expressing concerns over interest rates and how an anticipated rise next year could affect real estate purchases. A 1% increase in interest rates decreases buyer’s buying power by about 9%. Flood insurance has been another concern for Realtors. As of now, flood insurance rates are going up when you buy certain properties. Congress may delay the rate hikes for up to 4 years but all proposals are stalled at this time, so rate hikes are in effect. We’re talking about some significant hikes, and this could weigh on real estate prices for affected homes. All in all we’re confident and hopeful heading into 2014. There are some wild cards in the forecast as there is every year. The bottom line is a recovering economy can cure an awful lot of wild cards, so we’ll continue to track the economy, interest rates, flood insurance, health care costs, and any other issues that impact buyers purchasing ability and jobs. If you’d like to search the MLS, visit www.TopAgent.com and find your place in paradise today before interest rates go up. Good luck and Happy House Hunting! Earlier this week we noticed an influx of web registrations on our Search MLS site from up North and we wondered if perhaps the weather up North was turning cold. Each year, and especially in the brutally cold years, we receive inquires from our Northern friends looking at what they can purchase in sunny SW Florida. I understand their interest for our family moved to SW Florida in the 80’s from Illinois. I didn’t have to search too hard as last Monday night I turned on Monday Night Football from Chicago and the temps were below zero. I remember those days well. Even people flying in and out of the Fort Myers airport were delayed due to cancellations in Dallas and delays up and down the Eastern seaboard. Weather up North is frightful and it’s starting early in December. This could be a long winter if this keeps up. Chicago on Wed was forecast for snow and a low of -2 degrees. Green Bay WI was forecast at a high of 2 degrees and low of -8. 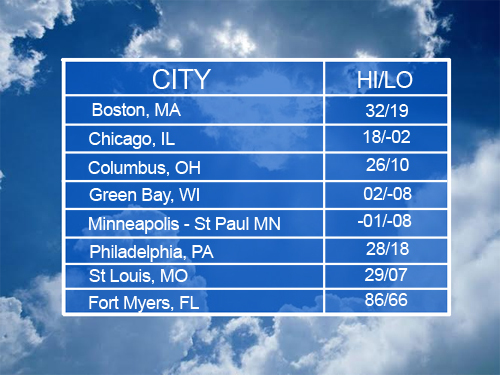 Minneapolis isn’t forecast to even hit zero. I’m writing this article on Tuesday just for frame of reference. Back in the 1990’s I put a little graphic on our website www.TopAgent.com that showed Fort Myers current weather. It registered like 80 degrees while GunnisonCO was about -40 that day. I had many inquiries that week from frozen people who were sick and tired of shoveling snow and dealing with the ice. Every bad winter since then we’ve noticed an uptick in fed up people looking to relocate. Not everyone is in a position to do so, but every year the baby boomers get one year closer to retirement and they start planning. Many snowbirds, as us Floridian’s affectionately like to call them, will come down and pick out a place they can purchase and use for vacation until they’re ready to make the move full-time. Some never make the move full-time but buy places their entire family can come vacation to in cold wintry times just like we have this week. We call it Season for a reason here in SW Florida because just as we enjoy some of our most beautiful weather of the year Jan-March, the snowbirds suffer through their worst. Some buyers look for a 1 or 2 bedroom condo on the beach, while others look for a single family home close to the airport for easy access in and out. Others want property on a golf course so they can golf while their friends back home are suffering through another snowstorm. Still others want a waterfront home on a canal so they can take their boat out and text pictures of the big fish they just caught to their co-workers. Nothing like rubbing it in. I can’t tell you how many times customers in our office can’t wait to rub it in to their friends about the place they just bought in SW Florida. We’ve even had a few customers ask us to email pictures of their new place to their friends just to boast about their new found vacation home. Of course, many of these vacation owners end up moving here permanently, or split time between the two homes. The vacation home purchase begins the process. Typical buyers who buy a vacation home will buy another home down here in the future once they get their job and family in a position where they can move. So here’s to that process beginning early this year, and with each cold snap or snowstorm we and other Realtors alike look forward to more phone calls and web registrations from our snowbird friends. Good luck and Happy House Hunting! We’ve been waiting on inventory levels to rise so that sales can pick up and as is traditional for this time of year, the market has responded. Single family home inventory rose over 400 units from September. Last year inventory rose almost 300 units in October. 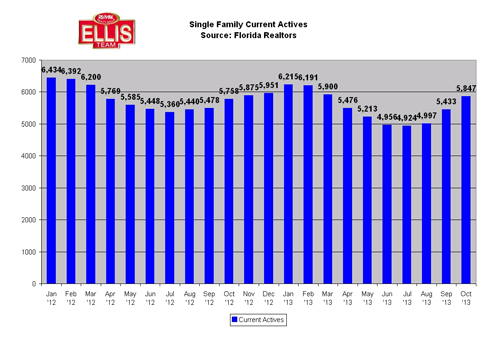 Inventory levels peaked this January and then began to fall as we outsold inventory as it came to the market. Hopefully our inventory will continue to increase heading into season so we have enough to sell this season. Median prices are up about 12% over last year. In recent years most of our big price gains have occurred February though May, so we’ll be watching to see this year how season affects prices. We expect to see higher prices this season which sets the bar for the rest of the year. In season we tend to have more cash sales which are less affected neither by appraisal issues nor from changes in interest rates. The economy seems to be improving which could lead to more market strength; however there are some wildcards on the horizon that could temper market gains. No one knows what affect ObamaCare will have on disposable income. If people end up saving money on the exchanges they’ll have more to spend on other things, which could help the economy and housing. However, if as is being reported insurance costs rise for a great number of people, this could have an adverse affect on the economy and housing. If more of people’s income goes to health insurance then they have less to spend on house payments or other things. If it adversely affects the economy, this slows down people’s disposable income as well. If employers either drop coverage altogether after 2014, or cut back on full time employees, this could definitively adversely impact the real estate market. It would also affect the stock market, business, and the economy as well. Interest rates are set to rise at some point as the government phases out buying treasuries to keep interest rates low in a down economy. The Fed’s have signaled the will end this buyback soon, and the question is simply a matter of when and how they will taper. If the economy takes off perhaps it can weather these two wildcards. People think the real estate market is either set by Realtors or happens in a vacuum, but the reality is it is influenced by many market forces and Realtors have little to do with prices. Realtors simply help buyers and sellers interpret the market based upon facts and data, and ultimately buyers and sellers make decisions about what they buy and sell. It’s kind of like walking into a store. If a product presents as a good value, buyers will purchase. If a product is inferior or over-priced, buyers will walk. Buyers today shop many stores and look things up on the Internet. A Realtor or seller can’t just set a price and expect the market to respond. It has to be based off of data and logic. Why Now Might be the Best Time to Buy! Back then we shared a chart which we’ll re-print today that showed how much purchasing power a buyer lost in 2 short months when rates rose a little over 1% in that time. A buyer lost about 10% purchasing power due to rising rates, not to mention prices have been going up so it became increasingly harder, if not impossible to find the same home for less money. We bring this up because we think it’s going to happen again. Prices are still rising and rates have dipped a little bit. 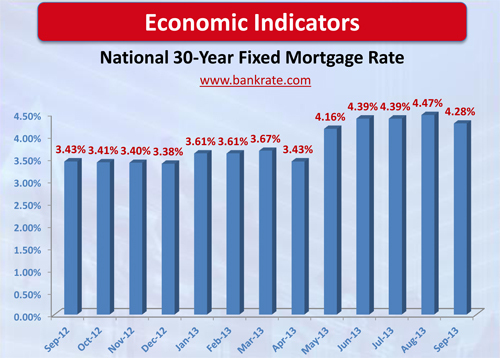 As of today Bankrate.com is reporting a 4.33% 30 year fixed rate mortgage. The reason we see rates going up in 2014 is because the Fed has signaled it will cut back in buying US Treasuries that have been keeping rates low. Market forces would say we should have rates over 5% but the US government has been trying to spur the economy by buying down the rates. It sounds like robbing Peter to pay Paul, and it is really, but its net effect has been to keep rates down which helps people buy homes. When people buy homes, they also buy appliances, carpet, paint, etc. Each home sale sets off a chain of events that pumps money into the economy. As the economy improves there is more pressure for the Feds to cut back on this program. Several large industry publications are speculating that possibly ObamaCare will harm the economy buy taking disposable income out of consumers and forcing them to either buy insurance or pay higher premiums. If this does harm the economy, the Feds will be able to continue buying down the rates artificially. If the economy would improve rates will go up. We have artificially low rates that will rise someday, and many are banking on 2014 coupled with rising prices nationally and locally. Prices may come down nationally for a few months due to seasonality but they do start heading up again in Feb or March if history holds true. We also posted an article on June 13 on the Blog on how rising prices and rising interest rates affects a buyer’s down payment and monthly payment. In one year the average down payment went up $8,360 and the average monthly payment went up $173.23 It’s getting harder and harder for buyers to save up the down payment, and the longer they wait the more they have to come up with. With rising rates, putting more down doesn’t mean lowering the payment. This is why buying now could save you both ways. We’re not saying this to spur more sales. I think the public thinks Realtors just do this because they need more sales. In fact, inventory is limited and it’s tough finding homes for buyers. There is no shortage of buyers, there’s a shortage of sellers. We say this to inform you of your options and hopefully educate you on what’s best for you. What we say is also backed up by facts and evidence that you can go back and read for yourself and compare to today. If you’d like to search the MLS check out www.TopAgent.com and hopefully you’ll find a home that meets your needs. Feel free to call us too at 239-489-4042 Sometimes we know about certain properties coming to the market before they hit MLS, or we may be able to help you with your online search.